The queen of all Sicilian desserts is definitely cannoli. Cannoli probably originally came from Arabs, who influenced so much of Sicily’s cooking. These crisp, flaky pastry dough cylinders are filled with sweetened sheep’s milk ricotta cheese, nuts, citron, and bits of chocolate. I cherish Nonna Saporito’s old recipe that originally called for sheep’s milk ricotta cheese for the filling but when she came to America, it was impossible to find, so whole cow’s milk ricotta was substituted instead. Whenever I make these, I use her old and very worn wooden forms, fashioned from a broom handle, but stainless steel forms are available in kitchenware stores. To make the filling, whip the cheese in a bowl until smooth. Stir in the granulated sugar, cinnamon, and chocolate. Refrigerate, covered with plastic wrap, until ready to fill the cannoli shells. To make the dough, place the flour in a bowl or food processor. Add the butter or lard and sugar and mix with a fork, or pulse, until the mixture resembles coarse meal. Slowly add the 1/4 cup of wine and shape the mixture into a ball; add a little more wine if the dough appears too dry. It should be soft but not sticky. Knead the dough on a floured work surface until smooth, about 10 minutes. Wrap the dough in plastic wrap and refrigerate for 45 minutes. Place the chilled dough on a floured work surface. Divide the dough in half. Work with 1 piece of dough at a time; keep the remaining dough refrigerated. Using a rolling pin or pasta machine set to the finest setting, roll the dough out to a very thin long rectangle about 14 inches long and 3 inches wide. Cut the dough into 3-inch squares. Place a cannoli form diagonally across one square. Roll the dough up around the form so the points meet in the center. Seal the points with a little water. Continue making cylinders until all the dough is used. In an electric skillet(see note), heat the vegetable oil to 375 degrees Fahrenheit. Fry the cannoli three or four at a time, turning them as they brown and blister, until golden brown on all sides. Drain them on brown paper or paper towels. When they are cool enough to handle, carefully slide the cannoli off the forms. 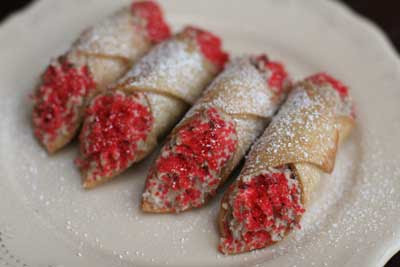 To serve, use a long iced tea spoon or pastry bag without a tip to fill the cannoli with the ricotta cheese mixture. Dip the ends into colored sprinkles, arrange them on a tray, and sprinkle confectioner's sugar over the tops. Serve at once. Note: If you prefer, you can fry the cannoli in a deep fryer. Be sure to fill the cannoli just before serving - any sooner will result in soggy shells.